from “Birmingham New Street” to “Longbridge” railway station, then by taxi. 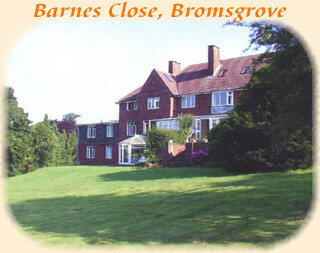 Or to “Bromsgrove” railway station, then by taxi, or by bus 007 (weekday daytimes only). 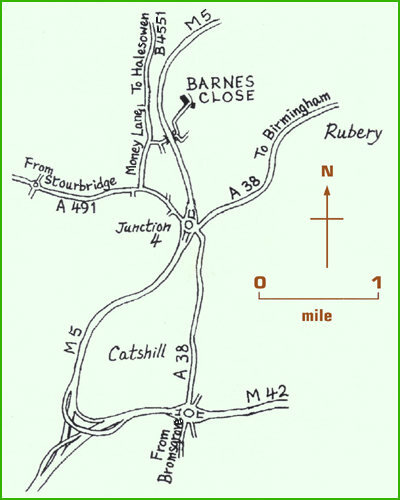 We recommend arriving and leaving from Longbridge railway station. Although both are around the same distance from Barnes Close, there are more connections arriving and leaving from Longbridge. Here are some local taxi companies which regularly do the Longbridge to Barnes Close route, which takes about 10 minutes and costs around £10. However, remember to bring these details with you because the taxi driver may need this map! First Midland Red 144 or Travel West Midlands 63, to Rubery then taxi. Ludlows 007 (weekday daytimes) from Halesowen to Bromsgrove and Ridditch passes the end of the drive. Alight on Money Lane at Malthouse Lane. Half a mile walk up drive. To Junction 4 of the M5 motorway. Take the A491 towards Stourbridge for half a mile. Turn right onto the B4551 (Money Lane) towards Halesowen. After half mile turn right into Malthouse Lane then bear left through tunnel under motorway. At end of tunnel turn left and Barnes Close is at the top of the drive.